Hey lovelies, let's talk foundation today. First off, I have a fair complexion. Recent years, my oily-combination skin has gradually become dry-combination with only the T-zone remaining slightly oily. I believe I have a neutral undertone. But I am still unsure. But after swatching my stash I realise I do have more (slightly) yellow-ish bases. Here's two websites I found that may help in finding out your undertones. Moving on. Here is my huge stash. I have made a silent promise to myself that I WILL NOT purchase any more liquid foundations in the near future! The first FOUR foundations are my absolute HG ones that I will always reach for when I'm in doubt and can rely on. The rest are in no particular order. *Updated 3rd March 2016 - I have to come in here and do a quick update. I have found a great moisturizing foundation from the drugstore that I love so so much! 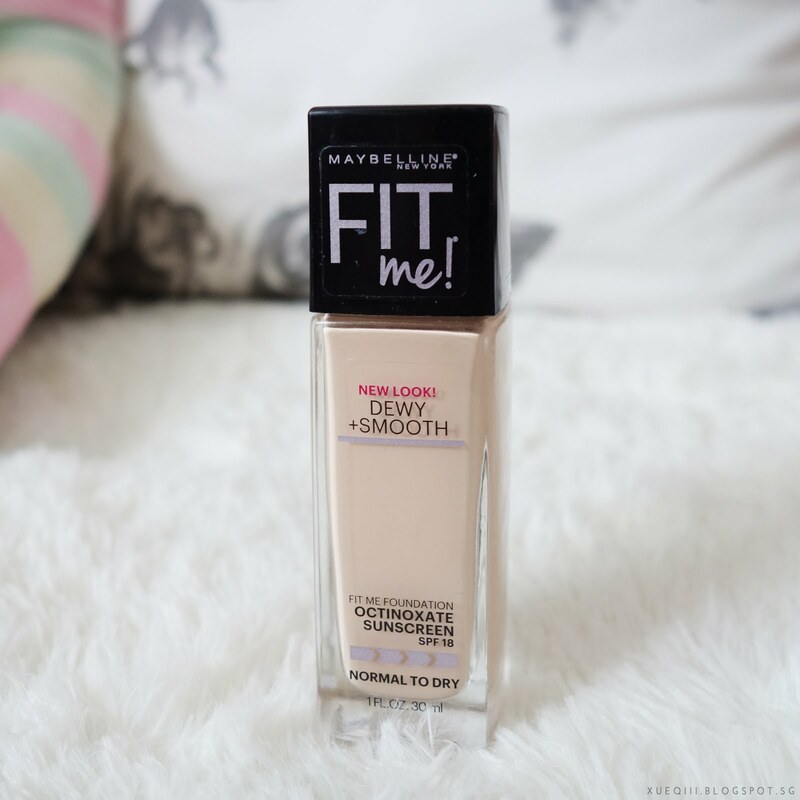 It is the Maybelline Fit Me Dewy+Smooth Foundation. This will work so amazing for drier skin types and it wears beautifully! I did have to touch up (blot) slightly on my t-zone as I still produce oil at those areas but it was worth it! I really want to use this more often on its own as it gives a very beautiful and flawless finish with medium to full coverage without looking cakey at all. But Singapore's Sephora has yet to stock up with the new shades that Too Faced just launched (2 lighter shades and 4 darker shades). I would love to get my hands on the lighter shades - Snow and Pearl, as this is wayyyyy wayyy too dark and even appear orange on my skin. I can only wear this if I mix with a lighter foundation (mostly L'Oreal True Match in N1) but that way, I can't enjoy the finish that this gives. I did try to mix Ivory with this in the store to see the shade but it is still too dark. Here is a shade comparison swatch done by Emily - she's a great YouTuber, go watch her! As you can tell, Porcelain isn't exactly fair enough and Ivory is quite yellow. They do need to come out with more neutral shades. Application wise, I recommend using a Beauty Blender or any type of dampened sponge for a flawless finish. Using brushes may look streaky and cakey at times. This is actually suitable for dry to normal skin types. Just pair it with a good primer and you're good to go. Too Faced recommends their Hangover Replenishing Primer - infused with Coconut Water. However, for extremely dry skin, you might need to be extra careful with prepping your skin. I have heard that this might cling onto certain dry spots. According to reviews, this doesn't sit very well on oily skin too - hard to blend in and the product just 'sits' on the skin sliding around. Overall, this gives a natural skin-like finish rather than a matte finish, so stay away from this if you prefer a matte look. This is priced at S$56 at Sephora, considered rather affordable for a higher end makeup brand. Just admire the packaging.. and the fact that it comes with a pump! This has got to be my favourite foundation so far. One that I will definitely recommend to my friends. And this is the ONLY foundation that I get compliments on, when I'm wearing it. Only this! Not sure what's the magic inside it but I can't believe my all-time HG foundation is so darn expensive. It is a definite repurchase for me but I'll probably only pick it up when I have the 10~20% off at Sephora. This is priced at S$73 if I'm not mistaken. DAS EXPENSIVE!!! I apply this either with a Beauty Blender or a blending or buffing brush. Works well with all. This sets quite fast so I suggest working on individual sections of your face at a time and don't dot it all over your face. This suits normal to drier skin types but I have seen a few combination-oily skin girls wear this and loving it as well - maybe try getting a sample from the store and test it out before purchasing as this is a pricey one. The key to making foundations work better is the primer, and of course prepping your skin well. This actually looks like skin with a buildable light to medium coverage. This evens out my skin very well and kinda has a 'blurring' effect. But I do not find this very sheer or very glowy..
One major downside - NO PUMP. What is pay $73 for a foundation with no pump!!!??!! Yes, I know I can pay another $10 for a reusable pump but then I can't put the cap back on. A very frustrating packaging. Another HG, fighting for first place with NARS. I have stocked up on the newer formula - ULTRA HD, during the 20% off at Sephora earlier. Still finishing up the one I have. I have to admit when I first bought the original formula, I kinda regretted it after a few uses and it was just sitting in my drawer for quite a while. I remember feeling that it was too visible on my skin and did not cover up much of my blemishes etc. Recently, I revisited this and have to say I really like it now! Not sure what I was doing differently, or maybe my skin has became drier? Like the NARS one, I apply this either with a Beauty Blender or a blending or buffing brush. This is definitely a lighter coverage with skin-like finish, so don't expect this to cover up scars on the first application. This can be easily built up to a fuller coverage and for that I will recommend using the Beauty Blender to avoid having a cake face. This is suitable for all skin types and I do recommend this over NARS if you have combination or oily skin. Price of this should be also around S$73 at Sephora. A highstreet brand product that is on the more affordable side. This particular foundation should be available only at Bourjois counters in departmental stores. I got mine off ASOS but shipping is slow and its OOS now. This bottle I bought at Metro for S$31.90, should be able to find it at Robinson and Isetan too. This I believe is quite a close dupe for the NARS Sheer Glow. Lasting power isn't as strong but can be improved with a good primer as mentioned. As you can tell from the name, this gives a very healthy look with, once again, skin-like finish. Can you see the trend here already? Haha. This has a light to medium coverage. Buildable of course as it has a serum texture, very light weight. Do note that this has a fruity scent - those sensitive to fragrance might want to avoid this one. Suitable for mostly dry to normal skin. Oily skin users might find this too dewy. Many can't decide between shades 51 and 52 for this. I own both so I did a comparison. This newly formulated Silk Creme Foundation is marketed to be long wearing and great for photos. I have seen extreme reviews about this foundation, either hating it or loving it. Many complained that this is a lot more runnier than the old formula and doesn't cover as much. Either I got a different batch or what, but to me this is very thick and matte! I would probably smack it on my face for a night out or some event, but maybe not an everyday foundation. I should have gotten the normal hydrating one instead of the oil-free version. Probably this is why I feel it being too thick and dry for my skin. I have mixed it once with the L'Oreal Light Infusing Primer and it looks a ton better with a illuminating primer! Sheer coverage just for evening out skintone and a very minimal makeup look. But again, another oil-free version that I regret getting as the normal one will be more hydrating and suit me better. On bad skin days, this can tend to cling onto little dry patches here and there after a few hours. Downside: This will oxidize..... look at the swatches below and you will know how bad it looks, considering this is suppose to be the lightest shade. Said to be a dupe for the Giorgio Armani Luminous Silk Foundation that all the beauty peeps love. I do like this foundation and recommend this for combination to oily skin types. L'Oreal actually just launched their newly formulated True Match and it is suppose to be more hydrating, even the shades are different now. I apologize for the out-dated information. Do try it out at Watsons S$30.90. This is more matte than the rest of the foundations that I own. This has a buildable medium coverage. I do enjoy applying this with brushes more - Real Techniques Buffing Brush. If I'm not wrong, Singapore only carry 6 shades S$30.90. Horrible shade selection. N2 is the lightest they have for neutral tones, and it is a tad too dark for me right now but the previous shade is R1, which is way too pink and light for most asians. This should be the Asian version of the True Match Lumi Foundation in the US as it has the exact same packaging. Texture is pretty much the same as True Match but this is for the dry skin users, with a dewy finish and applies well with all methods. I do enjoy this more than the normal TM but I just can't get my right shade here. As the name suggests, it is a demi-matte finish foundation with very strong lasting powers - claims to last for 24 HR. I never ever wear makeup for so long anyway. This provides a medium coverage and buildable to fuller coverage. This swatches very dark and pink as seen in the pictures below. Probably a wrong shade choice for me, but good thing is I can't wear this alone due to it being a matte foundation due to my dry patches. 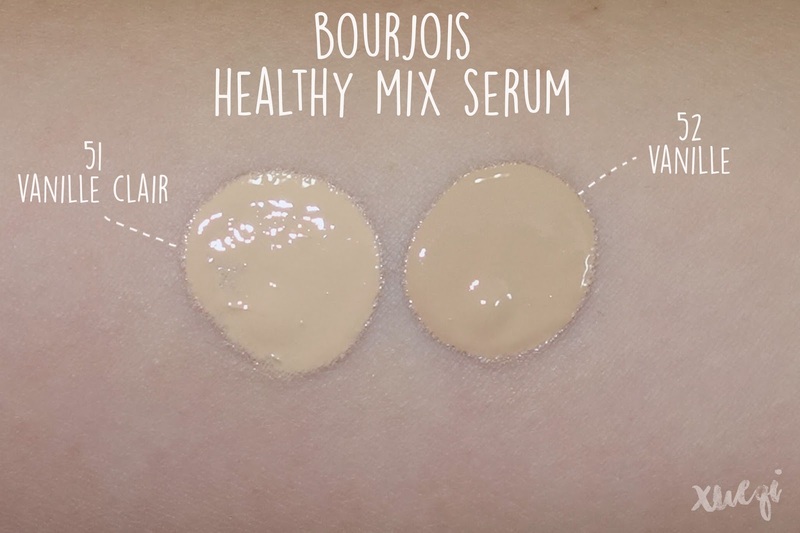 I mix it around with different dewy foundations in a lighter shade. Have yet to find the perfect combination but it mix well with most of my other foundations. Singapore do not carry this, I got mine off Carousell for around S$21+. This shade looks like its on the cooler side with pink/peachy undertones. Not a fan of that. This is probably why I don't reach for this as often as I want to. The coverage is rather sheer. I do prefer a light to medium coverage with just a single layer. But with this I have to build it up to my ideal coverage. I am too lazy for that. The formula is not bad I must say. A cheaper alternative to try out! Get it on Carousell, I think most of them are selling it at S$15ish only! Higher coverage CC cream and I really enjoy this for quick application if I am rushing as this applies very nice with fingers! This is great for what it claims to do and it is a way better option than the Laura Mercier Tinted Moisturizer! You can find this at Watsons around the S$20ish price range. Highly recommend this! For a period, this was all I used before discovering NARS. The lasting power was better than I thought and it kept my skin hydrated the whole day without clinging onto any dry patches. I only had to set my t-zone with powder. 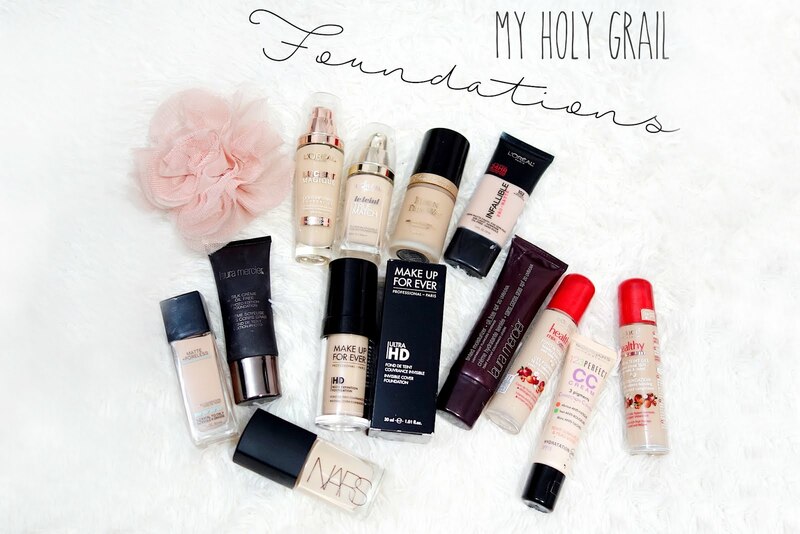 What's your favourite holy grail foundation? Hey girl, between the MUFE HD and BJ healthy mix serum which one do you find leans more olive yellow (not golden yellow)? Also have you tried the new MUFE Ultra HD yet and how does the shade compare to the old version you swatched in this post? I came across your blog as I am finding new foundations to try,and yes.. my problem was finding the correct shades. We have a few foundies in common yaaay ���� and I recently took photos of my veins at my wrist too *tired of determining my undertone* but anyhoos.. Have you tried the Maybelline Dream Velvet hydrating foundation yet? If you do, do post it. I think my shade is similar to you.. 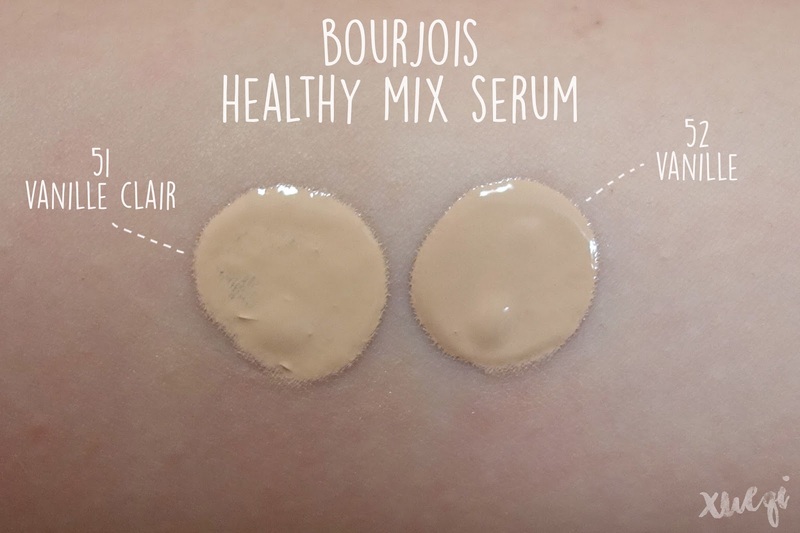 I use the same Loreal Lumi, True Match, MUFE and Bourjois Healthy mix foundation as yours. Hope u dont mind me reading thru your blog as you helped alottt! What shade of Double wear foundation do you use? I have it in the shade 1W1 BONE, it's a little too yellow for me as I'm more neutral but it looks fine. I couldn't find an exact shade match. Hope this helps!